The Festival is held in the historic towns of Central Tilba & Tilba Tilba on the South Coast of NSW. Use the Map to see the location and get directions. Is there a fee for entry? How can I buy a ticket? Yes. Proceeds from the fees pays for things like insurance, infrastructure and entertainment. Any excess is either re-invested into updating infrastructure and/or donated to local charities. You can use the Book Now button on the web site or Facebook page to get your tickets in advance. This will enable you to use the Fast Lane when entering. If you book on line in advance the Adult and Family entry is slightly cheaper but a booking fee will be added. You will still pay slightly less on line. $5 entry does not attract a fee. Stall places are very popular but there are currently a few left. Go to the Stallholders page. You will need to read the 3 documents there, then print and complete an application form then send to festivaltilba@gmail.com. This year we have a great selection of boutique businesses showcasing our local food and wares. Almost all the stalls are from the Eurobodalla or Bega shires and make their own goods. The quality of all food and wares is very high. As the Festival is a plastic free event we offer reusable bags for sale at the Dromedary Hotel stall. See the Map complete list of stalls, with details and links to their own FB page (where available). Can I join in the games? Yes please. We run 4 different competitive games on the day, some of them have heats throughout the day. Game times are on signs around the town and on the Map. Make sure you put your name down on the games sheet, which includes conditions of entry. To see the T&Cs, click here. What entertainment is there on the day? roving street entertainers and buskers. Check out the interactive map for locations of all attractions. The main street of Central Tilba is closed for the day. 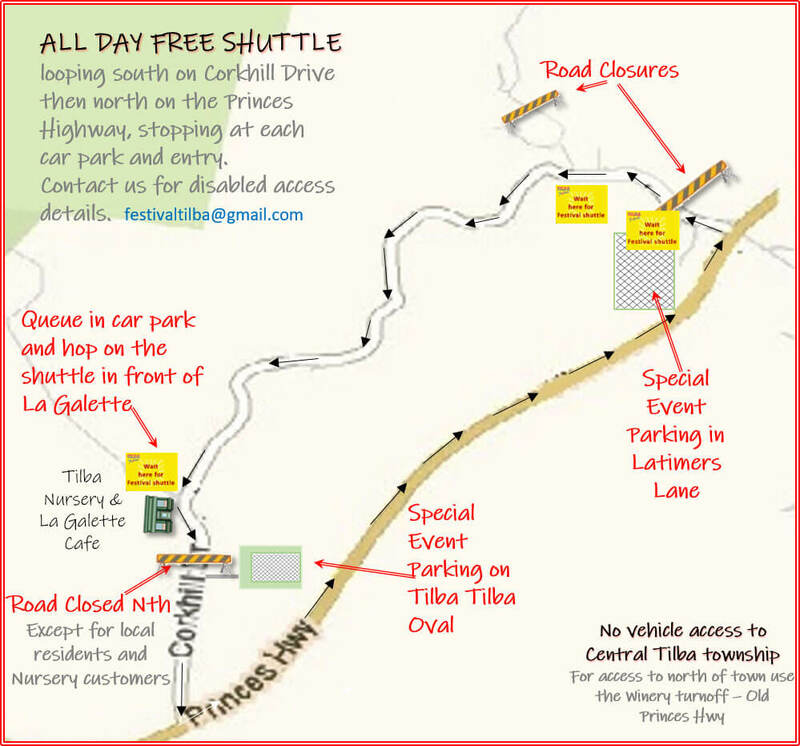 Access to the Festival is via Corkhill Drive, off the Princes Highway. There is parking at both north and south ends of Corkhill drive, and a free shuttle bus to take you to the Festival entry point. Location of the car parks is shown on the interactive map. Telstra service is good around the town and Optus is also fair, however there are some black spots. You can go to the Cheese Factory and the Tilba Sweet Spot for free Wi-Fi. There is very limited access to cash in Central Tilba on the day. There is no ATM. The Cheese Factory and Tilba Sweet Spot are happy to give cash out with purchases.